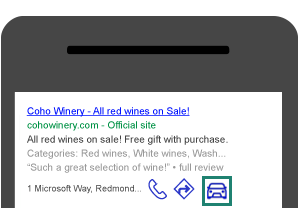 Add a clickable Get a Ride icon to your ads, a feature for Location Extensions. The Get a Ride feature for Location Extensions offers iPhone users an easy way to call for a ride to your business from your ad. A customer can click the ride icon in your ad that launches the Uber app and if they're logged in to their Uber account, the destination will be pre-populated with your address. This feature is like an annotation, where it could be automatically included in your ad with no additional set-up from your end. If you want to opt out of Get a Ride, please contact your Account Manager or contact support. Increases user value and engagement. Simplifies user efforts to reach your business location. Increases the chance that users will visit your business. If a customer is logged in to an Uber app, clicking on the Get a Ride icon will open the Uber app with the locations pre-populated. If a customer has an Uber account but isn't logged in to the Uber app, clicking on the Get a Ride icon takes the customer to the Uber sign in/register page. After signing in to Uber, the customer will need to enter the destination location. Clicks on the Get a Ride icon is charged like any other clicks to your ads. Reporting is available in the stand extension reports under "Get a Ride." The Get a Ride icon may show in areas where Uber is not available. If a customer clicks on the icon, they will receive a message saying Uber is not available.